While staying at your luxury Nevis villa, there are three main ways to get around the island of Nevis. Book before arrival in Nevis to avoid disappointment! If you call before your arrival in Nevis, Stedroy will cheerfully pick you up at Nevis airport. This has an added bonus of getting a free “mini-tour” of Nevis on the way to your villa. Now there are other reputable taxi firms in Nevis, but beware of what we like to call “tourist-taxis” These are generally not as colorful, are owned or managed by larger firms, and are a lot more expensive. Try to stick with the “owner-operator” taxis. We think you will find the ride a lot more enjoyable. 3. You can always jump on one of the local minibuses to get around Nevis. This is the least expensive ways to travel from point to point, and in our estimation the most fun. The local minibuses are very colorful, with fun names, such as Zion Train, Energizer, Rumours, etc. This is a cultural experience not to be missed! The buses will say on their windshield where they are going for those not in the know, and you can always ask the driver where he goes in Nevis or what bus you need to get where you want to go. To catch one of these local buses, just stand on the side of the road, and when you see one coming, just flag it down as you would a cab in New York or London. There really is no set time table, but the minibuses come by quite often. They will pick you up and drop you off at any point along their route. You can also catch these buses in town by the main square. 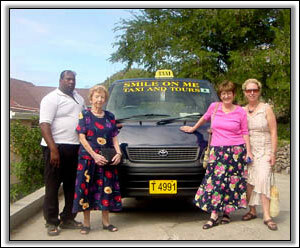 The fares are VERY inexpensive, and you have the added bonus of meeting some of the friendly Nevisians. 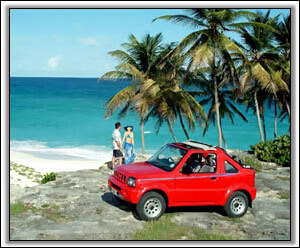 We strongly urge you to try this mode of getting around the island of Nevis at least once. For those more adventuresome, you can also hire mountain bikes or scooters (mopeds).